Just some general stuff I folded while working. A pig, a sphinx, and a six legged thing. The question still remains, what’s easier, the sphinx or the pig. 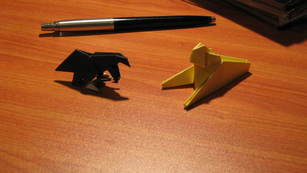 Both are really simple folds. I reckon the sphinx is easier. However, the six legged thing, while complicated, doesn’t resemble anything I know, and I couldn’t figure out how to make it look like something. This just goes to show, yet again, that less is more. 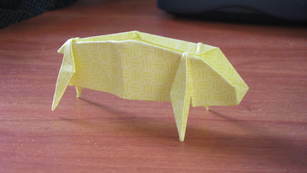 This entry was posted in Origami and tagged less is more, Origami, pig, six legs, sphinx. Bookmark the permalink.